APPSC Ground Water department Various Posts Recruitment 2016-Apply Online. 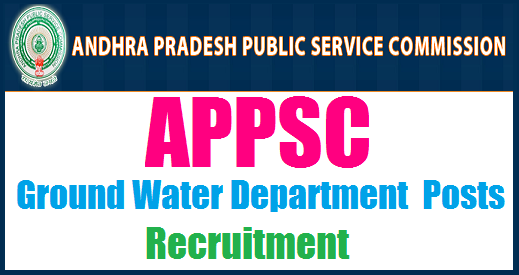 Andhra Pradesh Public Service Commission(APPSC) has announced the Ground Water department various posts recruitment Notification on 30-09-2016 Vide Notification No. 09,11,12,13,14,15/2016 Dt.30.09.2016 to fill the vacancies of Assistant Hydro geologist, Assistant Hydrologist, Technical Assistant (Hydro geology), Technical Assistant(Hydrology), Assistant Engineers(Civil),Lab Assistant posts and Online applications are invited from the eligible and interested candidates. The APPSC recruitment board will select candidates based on written test and interview. Candidates advised to visit the Notification before applying online. Candidates to be in regular touch with our website regarding any changes in APPSC Ground Water department Various Posts Recruitment Notification 2016. Must possess M. Sc. or M. Sc(Tech) or M. Tech in Geology or applied Geology or Hydrogeology of a University established or incorporated by or under a Central Act, State Act or Provincial Act or an institution recognized by the University Grants Commission or an equivalent qualification or any University recognized by the University Grants Commission under section 3 of the University Grants Commission Act,1956 or Diploma of Associate ship in Applied Geology of the Indian School of Mines, Dhanbad. Must hold a Degree in Civil Engineering with Geology as one of the subject of a University or an institution recognized by the University Grants Commission or must have passed section A and B of the A.I.M.E (India) Examination conducted by institution of Engineers (India) or M.Sc. [Hydrology] two years course from any University recognized by the University Grants Commission. Must possess M. Sc. or M. Sc (Tech) or M. Tech. in Geology or applied Geology or Hydrogeology or its equivalent qualification from any University or an institution recognized by the University Grants Commission or an equivalent qualification or any University recognized by UGC under Section 3 of University Grants Commission Act,1956 or Diploma of Associate ship in applied Geology of the Indian School of Mines, Dhanbad. Degree in B.E. (Civil engineering) with Geology as one of the subjects or M. Sc (Hydrology) 2 years course from any University recognized by UGC. Degree in Science with Chemistry as one of the subject of University (or) an Institution recognized by University Grants Commission. Eligible candidates can apply online mode through below given direct link. 9. Take a print out of AP Ground Water department Posts Recruitment 2016 application form for future reference.